Oak Bay New Music Festival 2018 | Oak Bay Music: Chamber Music Concerts Victoria B.C. 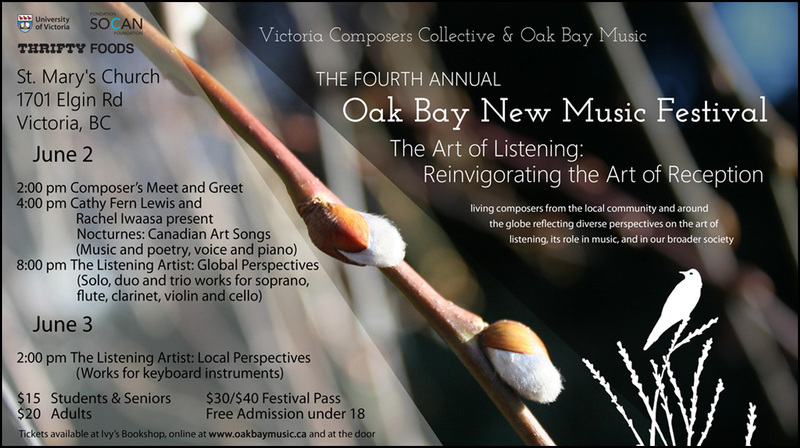 Oak Bay Music and the Victoria Composers Collective present their 4th annual Oak Bay New Music Festival. This year’s festival centers around “The Art of Listening: Reinvigorating the Art of Reception”. Composers from the local community and around the globe will reflect diverse perspectives on the art of listening, its role in music, and in our broader society. Saturday’s special opening concert program “Nocturne: Canadian Art Songs” features Cathy Fern Lewis (voice) and Rachel Iwaasa (piano). Voice artist Cathy Fern Lewis and pianist Rachel Iwaasa present an evening of Canadian Art Song. Join new music specialists exploring how themes of night, death, and love are expressed by notable poets and are set with rich, varied harmonic textures by some of Canada’s finest composers. Poems by Guillaume Apollinaire, Kollan Arici, Emily Carr, H.D., Pinget, William Richardson, and Dylan Thomas. Music by Harry Somers, Jean Coulthard, Anna Höstman, Lorna Paterson, Christopher Reiche-Boucher, Rodney Sharman, and Linda Catlin Smith. Performed by: Alexander Klassen (cello), Bailey Finley (flute), Hollas Longton (violin), Maria Eduarda Mendes Martins (voice), and Nathan Friedman (clarinet). Works for keyboard instruments performed by: Christopher Reiche-Boucher, Kimberley Manerikar, and Laura How. All events take place at the Chapel of St. Mary’s Anglican Church, 1701 Elgin Rd, Oak Bay. Tickets are available at Eventbrite, at Ivy’s Books, and at the door on the day of the concert. Availability is limited so please buy your tickets early to avoid disappointment.